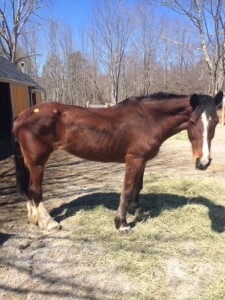 Sweet Pea arrived from the New Holland auction in April of 2015 and will be in quarantine for the next 5 weeks. She is a lovely bay and about 16.2 hh. This gentle older lady will need plenty of time to recuperate before she begins any retraining, as she arrived quite sore and underweight. We have no history on this girl aside from her previous three months, which were spent trailriding before she was returned to the auction to be resold. Sweet Pea appears to have led a busy life and will likely be best suited to pleasure or trailriding in the future. With her calm, kind demeanor we imagine that this girl will make someone a wonderful companion, and we look forward to learning more when we begin her retraining. UPDATE: Sadly, our time with this lovely girl was cut short. After receiving diagnosis of a severe and untreatable neurological disease (in this case an advanced case of EPM) we made the heartbreaking yet necessary decision to humanely euthanize Sweet Pea. We had all grown very attached to this sweet girl in the short time we were lucky enough to spend with her, so it was very disheartening to let her go. We take some sense of relief in knowing we provided her wonderful memories, a full belly and infinite love leading up to her farewell. We are happy to have had the opportunity to rescue this beautiful soul from an otherwise traumatic and painful fate. She left us in good spirits and peacefully, as if gracefully thanking us for taking her home and allowing her the dignified good bye she deserved.